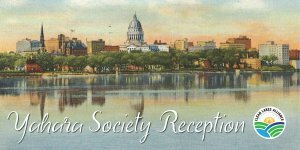 The Yahara Society Reception is an annual gathering to thank our Yahara Society level donors. Hosted by Tom Terry and the Terry Family Foundation with supporting hosts Joe & Susan Boucher. Join the Yahara Society The Yahara Society recognizes you or your workplace’s generous decision to include Clean Lakes Alliance in your annual philanthropic planning.